i ate there once as it is in a mall close by and i had the most awful tummy problems after..it was a buffet and i always go up for seconds in a buffet.but i never finished my first plate here..the meat was soo weird..and then a few wks later the news came out...i still gag whenever i am anywhere near that mall..yuck. ok, so enough rambling..dr. John sent me here running again. Okay, Quilly-Sister, I don't EVEN want to think about that! Chinese is my favorite food, but I only eat two things there...Palace LoMein or the Palace Sizzling Rice..and I don't eat the chicken out of either one of them. I always think the pieces don't look like any kind of chicken I cut up, and I've just heard WAY too many jokes about it. NOW STOP IT! Oh GAWD, that would be bad. LOL! My dh is 1/4 chinese, don't think I'll share this with him, but I snicker when I look at him for awhile! That's funny. 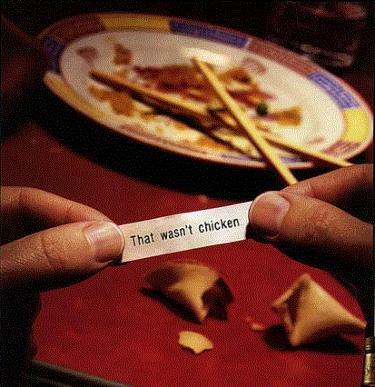 Had a friend who used the punch line "Tastes like chicken" for EVERY joke he told. Okay, thank you for that. I will think about it every time I eat oriental out now! Cruising over to look at your quest post. Don't need a reason to stop by you know that, but decided to participate in Dr John's Marathon. So just wanted you to know Dr John sent me. It was a lovely vegetarian dish of Quorn of course. Came via Dr John today. Guess it must have been rat then, it's all meat, what's the problem? It wasn'r one of your cats, was it? I saw you at Doug's. Good job. Ouch! Beware of the Terriaki today. Gee, and I was going to order Chinese tonight! Dr. John sent me!